As I mentioned in my previous post, we found a new butcher and got a beef tenderloin for a steal. Tonight I cut it into 8 filets and one roast. 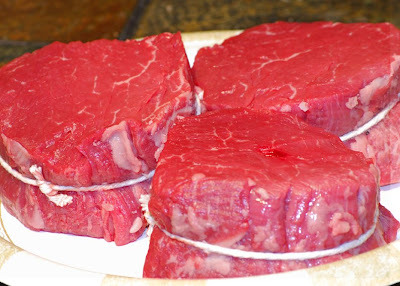 Around here, fresh filet mignon runs about $19 a lb but we paid $7.99 a lb, so trimming it yourself says a ton of $$ (even after shrinkage). I was going to post about how to trim one, but this video pretty much nails it. No I didn't go anywhere as fast as this guy. But here is the 411 on the twice baked new potatoes which is based on a recipe that I found in Southern Living (March 2007?) 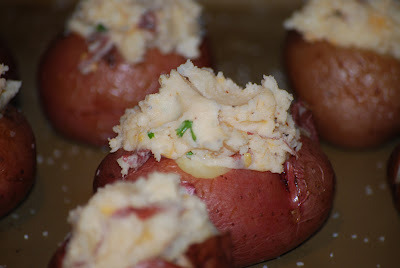 for Southwest Twice Baked New Potatoes. This is an amazing side dish or a great pot luck item for any special occasion. Cut a thin slice from the bottom of each potato to form a flat base; brush potatoes evenly with oil, sprinkle lightly with 1/2 teaspoon salt and place on a baking sheet. 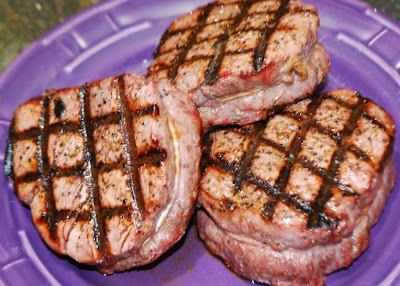 Bake at 350° for 45 minutes or until tender. Remove from oven, and let cool slightly. Cut a thin slice from the top of each potato and carefully scoop out potato pulp into a bowl, leaving shells intact like this. Add the remaining ingredients to potato pulp in bowl and mash together with a fork until smooth and creamy. You can be creative here and add in whatever else you want, such as; bacon bits, green chilies, or pimento. 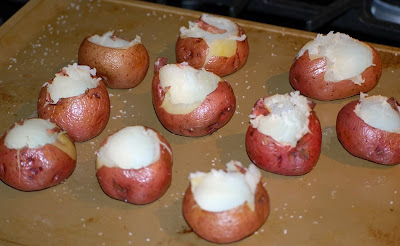 Spoon (or pipe) mixture evenly into each potato shell, and place on baking sheet. 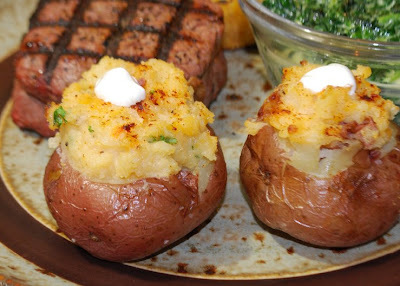 Bake potatoes at 350° for 20 minutes or just until lightly browned. Garnish with a dollop of sour cream and herbs just before serving. 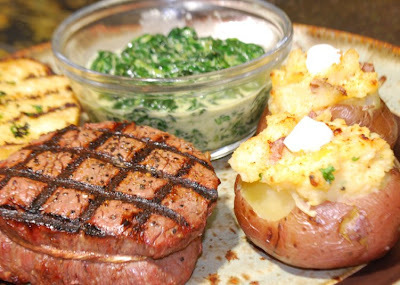 We served the steak and potatoes with fresh creamed spinach and garlic bread for an excellent dinner, our belated 14th anniversary dinner. Give these potatoes a shot some night when you want to do something different than the same old, same old. You won't be disappointed.